In late May, News Corp. released a new logo, seen above, to herald the split of the company into two parts: News Corp. (newspapers and publishing) and 21st Century Fox (entertainment). The logo release was something more than that too: described as being derived from the handwriting of News Corp. founder Rupert Murdoch and his father Keith, the logo seemed to indicate a return to family control, and that Rupert was to be literally hands-on as the corporation shook off its scandal. In the Guardian, Creative Review's Mark Sinclair noted, "In the era of digital text, handwritten lettering can appear honest, candid even." Note the can because this artless logo immediately seemed like something else. First, the handwriting of two people cannot be candid. It's been manipulated, apparently to create a better press release narrative. If you don't like Rupert, remember his father. It's also undistinguished. That initial N could never stand as a part for the whole logo, as anyone could write it. And the blobby ends of the N and P suggest Sharpie origins, the bleeding when you let the pen linger too long on your packing box. The black and white looks cheap, which may also have been the point, after a 20th century of geometric symbols and shiny gradients. Scripts are supposed to signal nostalgia, personal connection, with-love-from-me-to-you. But when anyone can make their handwriting into a font, has script lost its meaning? The Felt app: "Personal, handwritten cards. Sealed, stamped and mailed. All from your iPad." Another example: the Felt app, which I add to my list of perverse digital proxies. With this app you can pick a card from a stylish, letterpress- and wood-type-influenced selection, write a message and the address in your own handwriting, and a stamped, "personalized" physical card will be sent to your loved one. (I tried to send myself a sample but was stymied by my lack of stylus. Writing with my index finger made my handwriting look as bad as the Murdochs'.) 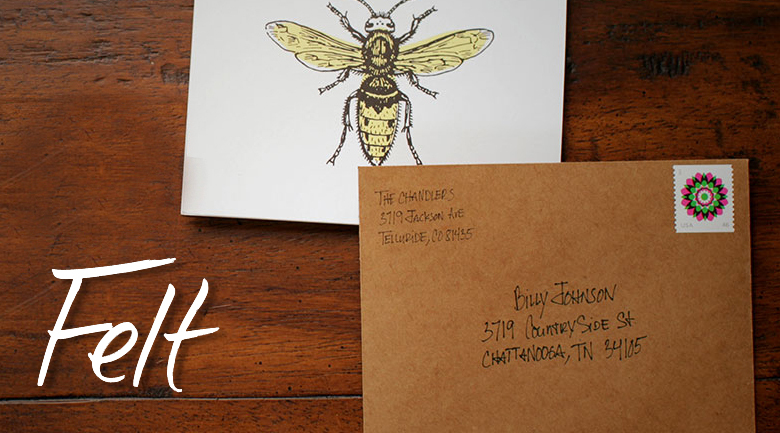 As in their logo, Felt is making a fetish of the awkwardness of real handwriting, enshrining it as a symbol of care while reducing the effort needed to select, write, stamp and address a card to the bare minimum. I'll admit that a thank-you or a happy-birthday is better than no recognition, but if you know the score, is this better than an email? Or just an elaborate way to give your mother what she wants without leaving the sofa? Again, if we can digitize the honest, candid hand, what's the significance of handwriting? Last but not least there is Instagram, which recently updated its own script logo. As a billion-dollar company, they clearly figured an off-the-rack script like Billabong would no longer do. Designer Mackey Saturday gave them an update, one which customizes without undue disruption. When the new logo made the rounds of the tech blogs in May the consensus seemed to be that it was OK: smoother and more professional, while still recognizably Instagram. Logo #1 was a scribble, Logo #2 was a product. But why a script? Instagram also traffics in nostalgia, candor, and (visual) messages of love. The "gram" is from telegram, so they could have gone with Western Union's distinctive capitals and stops. The service, like Felt, wants to suggest that a digital image can be just as personal as a handwritten note. I would agree that it can, but only when freed of the uncandid-candor of the digital script. Just look at Saturday's grid of capital Is. The one he finally chose is like no I I can imagine writing, so divorced is it from handwriting. If News Corp. had created a polished new script for itself, it would have seemed ridiculous, like a wolf in sheep's clothing. At least the homely handwriting is homely. But I'd argue it is no less ridiculous a choice, in this day and age, for Instagram. 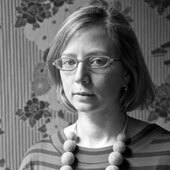 Our true digital signatures are the links and images that trail us (my yellow Marimekko avatar, perhaps). To promote the "signature" and the "script," relying on their old connotations, is absurd. Talking about things only because they are symbols of power is depressing. Though it is interesting that the author of Writing about Architecture is now discussing handwritten fonts and digital culture while Nicolai Ouroussoff is still 'writing about architecture.' Isn't it ironic, as Alanis says. Why is it that graphic design is the only field that everybody thinks is simple enough to be an expert on? It just reinforces the 'anybody can do it' mentality. I don't think you would see graphic designers claiming to be experts on architecture, because they would lack the experience, knowledge and context. There is a big difference. IS there anything more subjective than a person’s handwriting? Just when we thought a new News Corp logo would need to be more objective, News Corporation separates into (2) companies and “embraces” (Rupert Murdoch) its greatest asset. In this case, the subjective handwritten logo implies a trust and Rupert becomes the Brand. I'm glad to see these kinds of rebranding projects discussed with a critical eye. I went over to the page showing the logo process, and was disheartened to see so much "ink" given to diagrams of how it was vectorized. But this also demonstrates the main problem with a huge percentage of these kinds of logos: they are not done by hand in the first place and then they are badly vectorized. So although they are attempting to bring the warmth of the hand and the human into the corporate conversation there is no authentic human touch there in the first place. I specialize in signature logos as a lettering designer. (iskradesign.com and alphabetroadtrip.com) Done well they stand out with life and force and a true voice. The process may involve hundreds of quickly done handwriting pieces which are then meticulously refined to incorporate design, legibility and the right balance of identifying characteristics. The final step is vectorizing, and it has to be done with complete fidelity to the work originally done by hand. The News Corp logo is painful-- that r doesn't look like an r and it is clearly a vector artifact, as is the rest of the piece. The Instagram logo has been stripped of any quirks that would suggest a person actually writing and instead seems to refer back to the "nostalgia" of scripts used in the '50's and Madmen era. Except that again, the quirks and unique characteristics of those scripts, which were done uniquely for each ad, have been removed, leaving slickness in its place. The practice of vectorizing is now shaping the idea of what a letterform is supposed to look like. I find that if the letter is smooth and looks like an Illustrator file the public increasingly will not notice that it is either ugly or illegible. I think the author's dismissal of handwritten elements in the digital world is hasty, perhaps influenced by the unconvincing attempts she has seen. I disagree that today's signature most authentically is a series of links or images or a blinking avatar. Every office I go to has post-its with handwriting stuck to the edges of the computer. The monitor is our modern "paper" and as such a signature makes perfect sense in this context. And in fact more and more of the campaigns I work on are done entirely in handwriting, and intended for the ipad or another digital device. As to designers writing about architecture and visa versa, I say go for it! Letterforms ARE architecture, and there has been a powerful connection between the two fields for centuries. 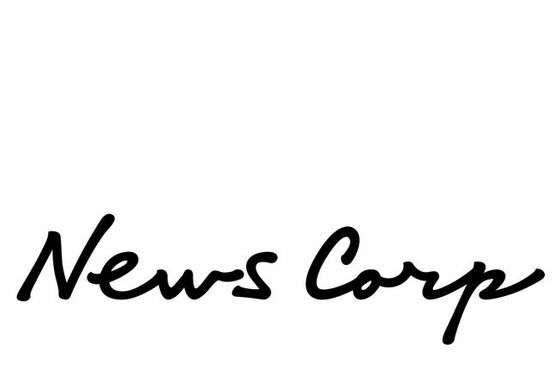 News Corp's choice of a handwritten logotype seems indicative of a larger shift in corporate identity. From the ornamentation of early companies through Rand's minimalism, 20th century corporations usually strove for apotheosis, a transcendence above people's ordinary lives. The brand was a precise and perfect icon. But now a multi-billion dollar media conglomerate with questionable ethics can project an image as friendly as a farmer's market. What if this is just the beginning of big companies realizing they can speak softly, while carrying a big stick? I think the main concern many companies have now around image is looking too removed, too cold, or (perhaps as result of the recession's Wall Street stigmas) even too big. It's not to say that there haven't been handwritten logos before, but I can't recall any company of this size, particularly in this industry, embracing such a colloquial mark. I wouldn't be surprised if News Corp. marks a new wave of handwritten, asymmetrical corporate identities. "Black and white looks cheap.." This is a debatable assertion. Massimo Vignelli has said black and white is like a tuxedo. The Saks Fifth Avenue identity is in black and white. Do those colours (or lack of them) really cause things to look cheap or are there other contributing factors? The character of the line quality and the negative spaces in the letterforms do show a lack of consideration. That lack of consideration is a greater indicator of cheapness to me. Instagram feels polished by comparison. The recent redrawing of the Mail Chimp word-mark by Jessica Hische posted on Brand New is also worth a look. It does a great job of conveying the personal touch of a craftsperson. Hand writing fonts are often impersonal and badly designed because the unique opportunities that truly custom handwritten words provide ( contextual characters, swashes and ligatures) are rarely included or balanced in relation to each other. If News Corp is a careless, bumbling operation that is so driven to beat it's competitors they'll engage in unethical behaviour, a mark reflecting those qualities is actually authentic. If it were more beautiful the mark might misrepresent the true nature of what it represents.